This poster bed with canopy creates a luxurious setting for your master bedroom suite. As sophisticated as it is inviting, this bed encourages relaxation with the faux leather upholstered headboard trimmed with nail heads. 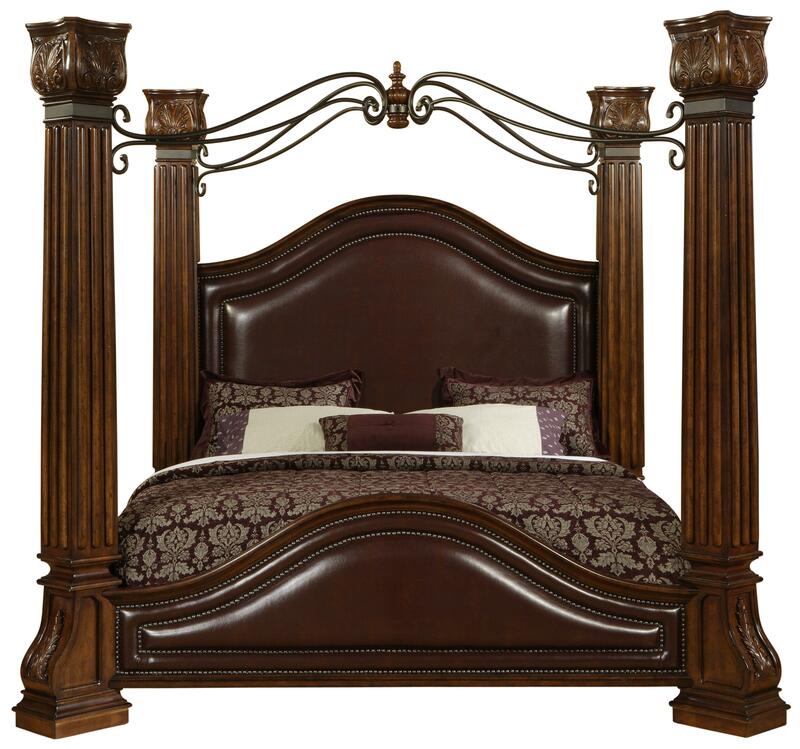 Soaring carved wood posts with a metal canopy complete this traditional bed with dramatic flair for impressive surroundings in your home. This bed is available in queen, king, and California king sizes. The 9241 King Canopy Bed with Faux Leather Headboard, Wood Posts, & Metal Canopy by Lifestyle at Furniture Fair - North Carolina in the Jacksonville, Greenville, Goldsboro, New Bern, Rocky Mount, Wilmington NC area. Product availability may vary. Contact us for the most current availability on this product. C9241A-KX3-XXCH King Headboard Post Set 1 9.25" 9.25" 77.875"
C9241A-KXW-XXCH Set of King Post Caps 1 10.25" 10.25" 9.625"
C9241A-KPF-XXCH King Footboard Panel 1 73.75" 3" 21.75"
C9241A-KXV-XXCH King Canopy 1 57.25" 5.25" 8.125"
C9241A-KXP-XXCH King Siderails 1 1.5" 81" 7"
C9241A-KXH-XXCH King Footboard Post Set 1 9.25" 11.875" 77.875"
C9241A-KP0-XXCH King Headboard Panel 1 72.125" 3.5" 41.75"
Case Detail Bun Feet. Carved Pilaster Trim. Bombe Shape Casegoods. The 9241 collection will amaze you with its traditional style and grand scale. 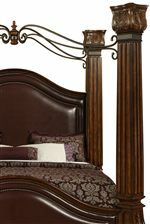 The rich finish accentuates the detailed carved accents found throughout including the poster bed with canopy and bedroom storage pieces. The faux leather padded headboard and footboard with nailhead trim add comfort to the striking style of the poster bed with tall posts and metal canopy that will become a captivating focal point in your master suite. 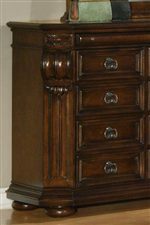 The dresser and nightstand each feature special slim drawers that are ideal for jewelry and other small items. 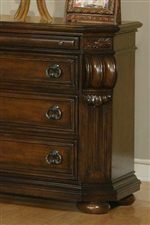 The 9241 collection is a great option if you are looking for Traditional furniture in the Jacksonville, Greenville, Goldsboro, New Bern, Rocky Mount, Wilmington NC area. Browse other items in the 9241 collection from Furniture Fair - North Carolina in the Jacksonville, Greenville, Goldsboro, New Bern, Rocky Mount, Wilmington NC area.